Influence is the topic of the moment (as well as the next decade). In the wake of our very successful Future of Influence Summit earlier this week, not one but two significant studies of influence on Twitter were released today. 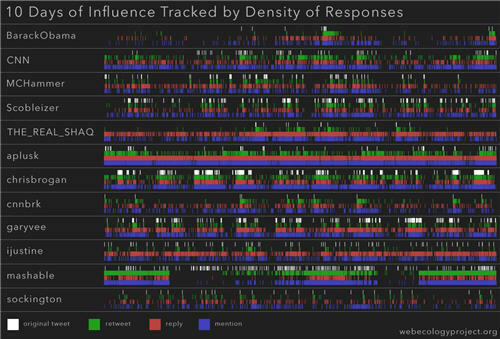 An extensive study titled The Influentials: New Approaches for Analyzing Influence on Twitter, created measures for relative influence, tracking in detail 12 popular users. Commentary on this further down in this post, and a nice visual showing response density to these users below. Rapleaf, whose CEO Auren Hoffman spoke at Future of Influence Summit, released a quite different report showing the change in the structure of the Twitter ecosystem in the period late-March to mid-June of this year, during which time Twitter usage grew 60%. Rapleaf, in the course of doing a study to identify influencers in one of their clients’ customer community, came up with some interesting statistic in the dynamics of the most prominent Twitter users. The published elements of this study focused only on numbers of Twitter followers, which are only a moderate proxy of influence, though showed some interesting insights. One of the most prominent was that the “popularity gap” between the most prominent Twitter users and the rest is growing. This is not at all surprising, and we can expect this to continue to grow, while maintaining the power law distribution that typifies scalable networks. Techcrunch has also written about this study. We define influence on Twitter as the potential of an action of a user to initiate a further action by another user. Unfortunately they only include replies, retweets, mentions and attributions as actions, and they do not seem to include click-throughs of links, which is one of the prominent actions taken in response to Twitter activity, and for publishers, by far the most meaningful one. While there is currently no way to directly measure this, clearly activity taken outside of Twitter (e.g. buy a record, go to a movie, vote) is a far more important outcome of influence than online activities. It is important to note that the study has directly compared the influence of tech commentators, news outlets, celebrities and others. This is close to meaningless. Influence is context-specific, and the Twitter-based influence of @BarackObama, @Scobleizer, @CNN, and @aplusk cannot be compared directly based on figures such as follower counts and responses. There are now quite a few studies analyzing Twitter statistics to derive measures of influence, some of them more sophisticated than others. The state of the art is advancing rapidly due to the attention being paid to this space. However these studies will become far more useful and relevant once they start to bring in data from other sources.